The King's Own Scottish Borderers (KOSB) was an infantry regiment of the British Army, part of the Scottish Division. It was raised on 18 March 1689 by the Earl of Leven to defend Edinburgh against the Jacobite forces of James II. It is said that 800 men were recruited within the space of two hours. The Regiment's first action was at the Battle of Killiecrankie on 27 July of the same year. Although this battle was a defeat for the government army, the Jacobite commander, Viscount Dundee (Bonnie Dundee), was killed by a volley fired by Leven's Regiment, bringing an end to James II's attempt to save his throne. The Regiment was judged to have performed well and was granted the privilege of recruiting by beat of drum in the City of Edinburgh without prior permission of the provost. For a period it was known as Semphill's Regiment of Foot, the name under which it fought at the Battle of Culloden in 1746. When the British infantry were allocated numerical positions in the 'line' of Infantry the regiment was numbered 25th Foot (based on its formation date) in 1751. The Regiment fought at the Battle of Minden on 1 August 1759 with five other regiments; this battle honor was celebrated by the Regiment each year on 1 August. The 25th was the county regiment of Sussex from 1782 to 1805, before its recruiting area was moved to the Scottish Borders region. From then it was known as the King's Own Borderers, becoming the King's Own Scottish Borderers in 1887. 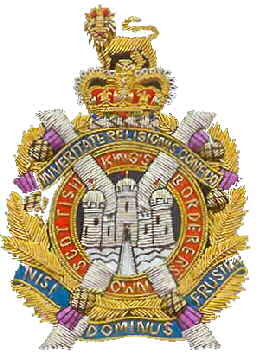 The Regiment was affectionately known by the Scottish public as the "Kosbies" but this term was never used within the Regiment. In 2004, as part of the British Government's defense review, it was announced that the Scottish Division would lose an infantry battalion. This was achieved through the amalgamation of the King's Own Scottish Borderers with the Royal Scots to form the Royal Scots Borderers on August 1, 2006. This single battalion became the 1st Battalion Royal Regiment of Scotland. Meerut is an ancient city located 56 km (35 mi) north-east of New Delhi, India. Meerut is famously associated with the Indian Rebellion of 1857 against the Company, when chants of the popular Hindi slogan "Dilli Chalo" ("Let's march to Delhi!") were first raised here. The K.O.S.B. formed part of the British Meerut Division. He was born on November 29, 1860 at Burnfoot, Falkirk, near Stirling, son of William Balloch, an iron moulder, and Helen (Oswald) Balloch. He was well known in his day as a composer, with a number of his tunes published in James Robertson's (Royal Scots) book. Unfortunately, many of the tunes in this book don't list the composer. His compositions were popular enough that long after his death his son continued to receive royalty payments for performances of his tunes on the BBC. Though he retired as a Pipe Major around the turn of the century and opened a tobacconist shop in Greenock, he and his older son Donald enlisted when the Great War started in 1914. John was 54 and Donald was 17 and they served in the trenches together. 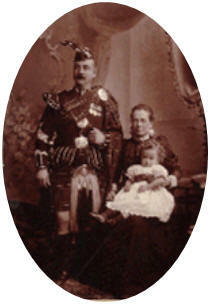 He also had a second son, Ian Allister, born in 1901. John Balloch was awarded the Meritorious Service Medal in 1932. John Balloch died on September 3, 1947, Thomson Home, Rothesay on the Isle of Bute at 86. His profession was listed as 'Pipe Major, Retired.' His wife, Elizabeth Ann (Porteous), had died two years earlier at 85.